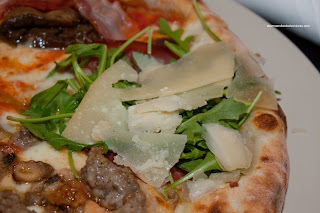 Awhile back, Mijune and I were invited to try out a new Italian restaurant on 4th Ave. The BiBo is the brainchild of Carlo Lorenzo Bottazzi and Andrea Bini who traveled to Vancouver from Italy attempting to extol the virtues of an authentic Italian gastronomical experience. We never made it out to their initial invite due to the Foodie Feast. Finally, with a break in our schedules, Mijune and I shoehorned this dinner between Bake for the Quake and blogging. In fact, we were late for our reservation since there was a 45 minute wait to get into Bake for the Quake. Kudos to Melody and Joy for organizing such a successful fundraiser. On a side note, it appears that Mijune has replaced Kim as my partner in eating. Seems like a good trade for me, Mijune is a whole lot better looking! When we finally did arrive at The BiBo, Andrea spent some time chatting with us. Boy, he is Italian alright. From his passion about food to his wonderful Italian accent. In fact, he chose this location for its existing wood-burning brick oven. Ah yes, no wonder the place seemed familiar to me. Originally, this location was Portobello back in the 80's and early 90's. 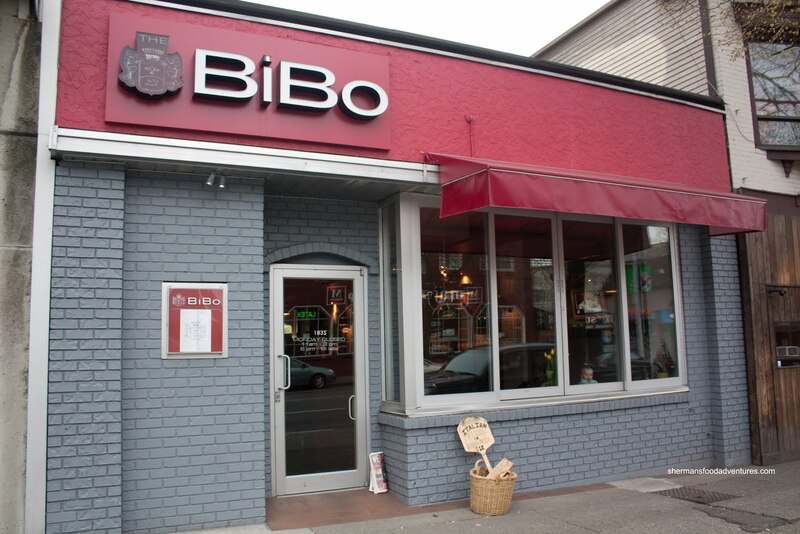 Then it became an Indian restaurant and now it has become The BiBo. 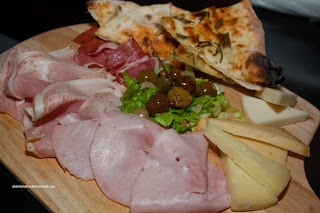 As Mijune and I settled in with some beverages, we were presented with an Antipasto Platter to start. The platter consisted of 3 cheeses (Fontina, Tallegio and Pecorino) as well as 3 meats (Prosciutto Cotto, Prosciutto Crudo and Ham(?)). Completing the platter was olives, pickled pearl onions and house-made focaccia. With any meat and cheese platter, the quality of the ingredients are what make or break it. So, not to sound uninteresting, the platter was good. However, the one variable was the focaccia. Essentially the same as the pizza crust except with nothing more than rosemary and olive oil, the focaccia was pretty good. I thought the dough was seasoned properly while Mijune thought it need a bit more salt. The bread itself was chewy and slightly crisp. It made us feel excited to try the pizzas later. Next, we were presented with a plate consisting of 3 pastas. We started with the Rigatoni Alla Norma. Hands down this was the best of the 3. The combination of grilled eggplant, tomato, basil and salt ricotta cheese was truly a flavour explosion as the menu states. At first, there was a hit of tang and slight sweetness ending off with a salty kick. 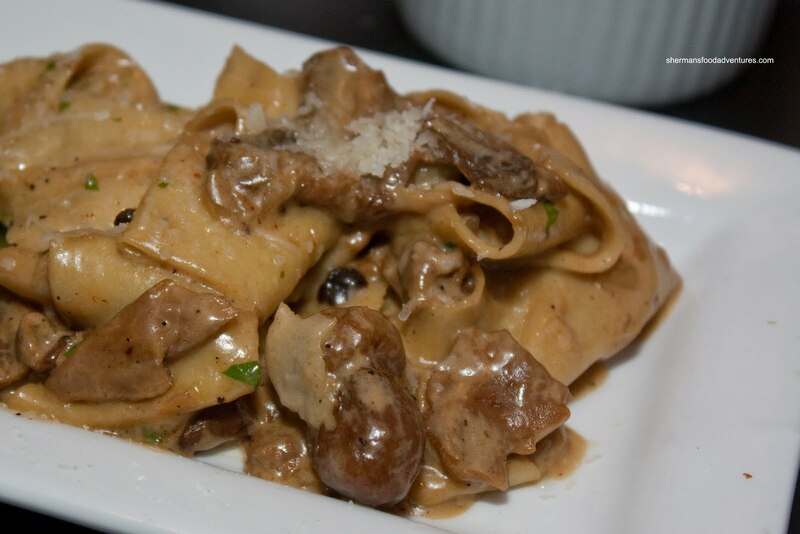 With this flavourful sauce caressing the really al dente pasta, we would order this again. Onto the Pesto Gnocchi, it had a pleasing green hue that screamed out fresh. One bite into the soft gnocchi and it wasn't as flavourful as it appeared. 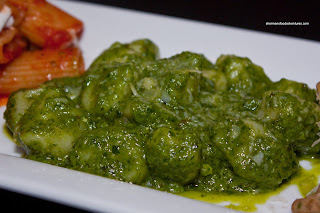 At first I thought the gnocchi was too soft; but as I waited for it to cool down a bit, it was the texture I personally liked, which is soft while maintaining some form resistance. 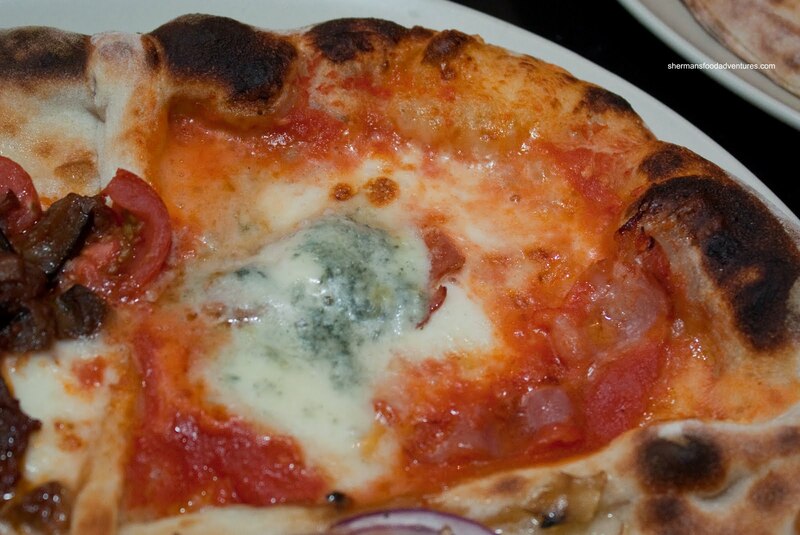 It was explained to us that the basil is specifically imported from Italy. Hence, I am not sure if it is supposed to be more mild or not. I did get a sense of the herbiness at the end; yet it was still very understated. Lastly, we tried the Bibo Matteo which is apparently a close family friend's recipe. It consists of wide pasta bathed in a creamy porcini sauce. Okay, I have to admit the back story gives the pasta an almost mythical quality, however, we both agreed that this was the least favourite of the three. I'm not saying this was bad by any means, it just didn't have the impact we were hoping for. The pasta was past al dente and the mushroom sauce was indeed creamy; yet not particularly Earthy. It has the potential of being a great dish. It just needs a bit more punch. So we could try as many different types of pizza as possible, they made 2 pizzas divided into quarters. We started with the Margherita Formula One made with San Marzano tomatoes DOP, buffalo mozzarella and basil. 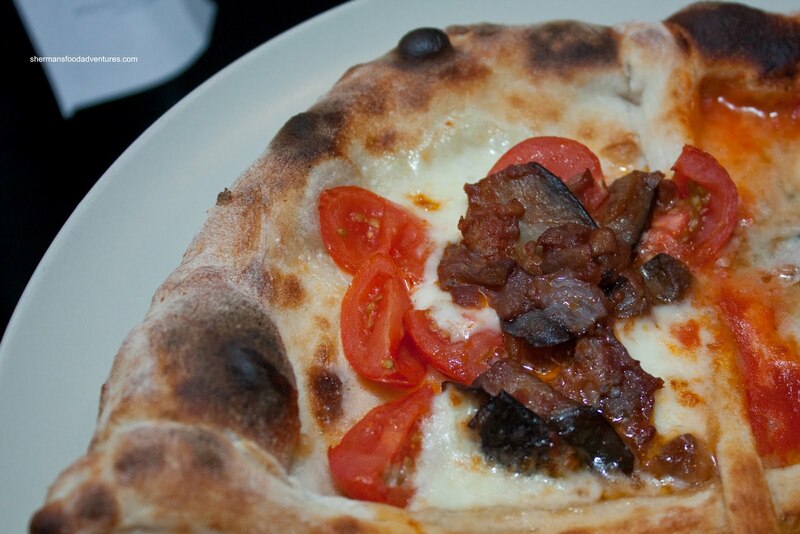 As evidenced in the description, this pizza is serious. 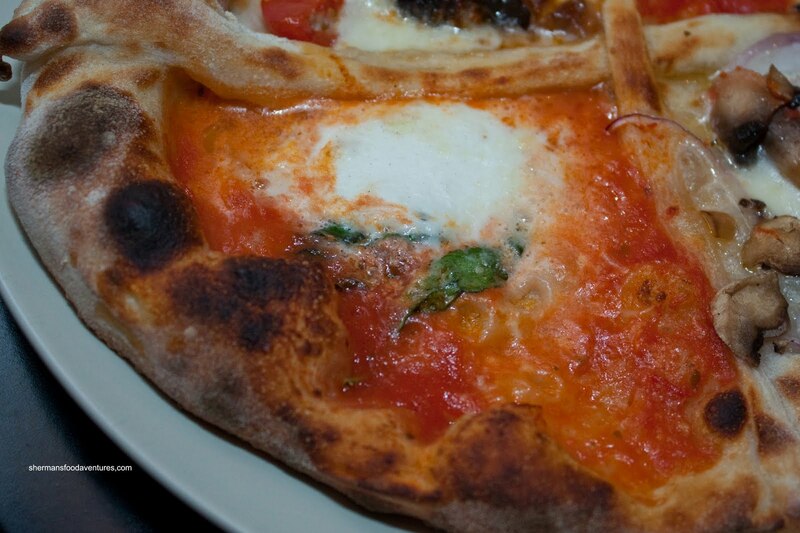 From the certified San Marzano tomatoes to the buffalo mozzarella, this is authentic as it gets. In terms of flavour, it was pretty good. Well-balanced and very similar to the one served at Nicli Antica, down to the charred crust.. However, the one big difference was the centre of the pizza. It was very soft and limp. We brought this up with Andrea and he acknowledged that and assured us that the pizza is authentic. On the opposite side was the Pancetta & Gorgonzola. This one was a flavour explosion due to the sharp gorgonzola. That in itself made the pizza sing and was my one of my favourites. I didn't have the same sentiment for the Eggplant and Tomato though. Nothing wrong with the eggplant since they do prepare it very well here. It was the tomatoes. They were very bla nd and didn't provide the tang we were looking for. Not a bad pizza per se, it just didn't interest us much. 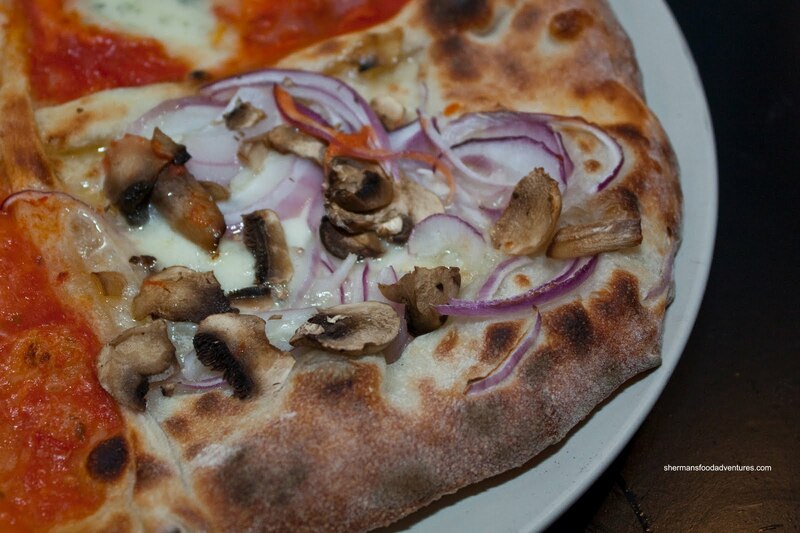 The last quarter of this pizza was the Red Onion and Mushroom. Despite the obvious lack of meat that might make me biased towards it from the outset, Mijune echoed the same sentiments about this slice. It was alright; but did not elicit much excitement. This would be okay for someone who likes onions and mushrooms. Now onto the next pizza, the first bite was my favourite. The Baccone absolutely rocked. The combination of prosciutto, eggplant, spicy salami, provola, tomato and mozzarella was both well-balanced while providing a multitude of different flavours. I felt the the spicy salami had just enough kick without overwhelming the other components while the marinated eggplant gave a nice tang at the end. After this carb-fest, I was already throwing in the towel. Mijune, on the other hand, was just revving up for dessert. Predictable. And luck would have it, more carbs for dessert! On the dessert platter, there was the Chocolate Pizza on the outside and the Sweet Pizzacotto at the centre. 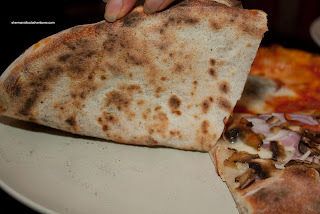 I have to be honest here, I was not a big fan of the pizzacotto. Maybe I was on carb overload? I'm not sure, but I found the layers of pizza dough to be heavy and the layers of sweet custard did not stand up to it. If it were up to me, I would've preferred thinner layers of pizza dough with more custard in between. 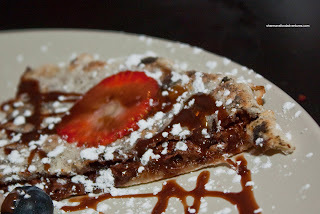 On the other hand, I liked the Chocolate Pizza. It reminded me somewhat of a Chinese dessert which has red bean paste encased in dough and pan fried. However, this one was much better since it was sweet chocolate. The dough wasn't too t hick and the chocolate was silky. Despite being full, I managed to eat a whole slice. Now you'd think we'd all had enough food right? No, not Mijune. She's an eating machine! 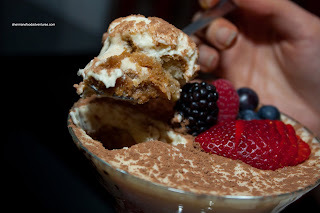 She requested to try the Tiramisu and in the end, it was a great idea. Although not teeming with espresso, the tiramisu was delicious without being too sweet. The custard was creamy while the lady fingers were soaked enough to melt in our mouths. I personally liked the fresh fruit in both desserts since it was refreshing and visually appealing. Okay, lemme put this out there. Ever since The BiB o opened, there has been plenty of hype. After all, they invited many of Vancouver's food bloggers for a tasting including myself and Mijune. 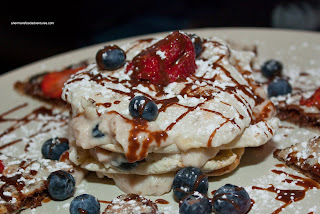 Therefore, the majority of the write-ups you see on Urbanspoon are a result of this. So what's the deal on The BiBo? Exactly what I just wrote. 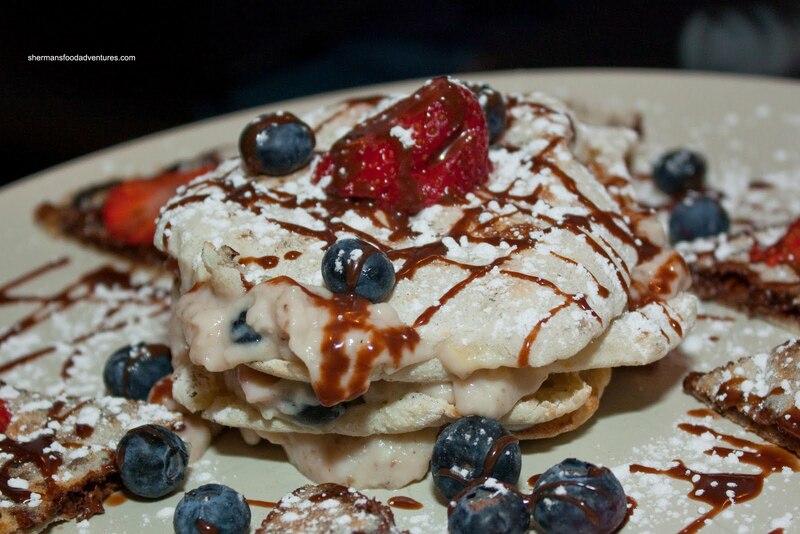 There are some really good ideas and the owners are serious about the ingredients. They go as far as importing specific items from Italy to preserve the authenticity of the food. Now with that being said, there were some things that were better than others. 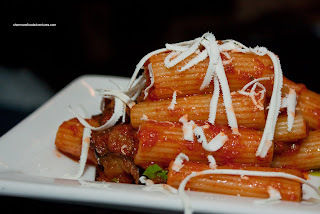 The pastas we did try exhibit potential with the rigatoni impressing while the Matteo being only okay. 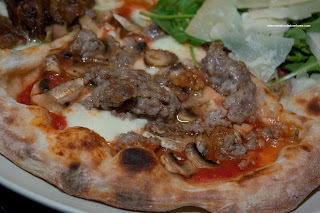 The pizzas as a whole have some pretty nice flavour combinations; but the crust itself was a bit soft for me. We thought the Tiramisu was really good as with the Chocolate Pizza. The jury is still out on the Sweet Pizzacotto. Of course we really can't comment about the service since they knew we were there. They were friendly naturally; but they could've checked on us a bit more often. I loved the vibe and decor of the place, it really is lively and the Italian movies playing on the back wall is a neat trick. The bottom line? A decent place that takes its food seriously. Give it some time, there are still some growing pains. 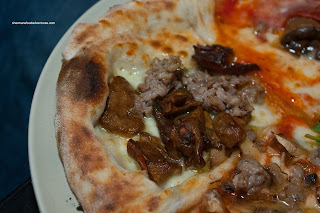 The time we went there, pastas were good, pizzas were too soft in the center. The soggy center might be too authentic, but not to my aesthetic (personally prefer it to be not THAT soft and the crust a tad more crispy). They seem to be doing well, so kudos to them. 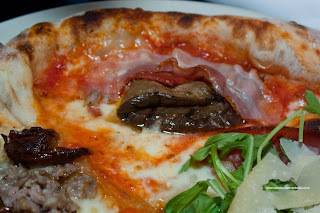 @eatingclubvancouver_js Yah, the food was pretty decent. Same with you, the crust was too soft for me in the centre; but that is personal preference I guess. 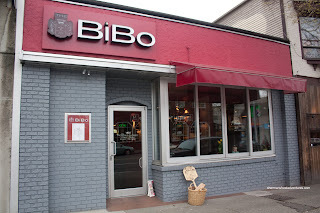 I had a chance to try The Bibo...and their food is definitely top notch, very fresh and taste. I did find some portions a bit small for the price, but you get what you pay for. Definitely would like to revisit in 6 months!